Since their first gym opened in 1965 in Venice Beach, Gold’s Gym has been a major player in the fitness industry. While some experts feel that the home exercise equipment made by Gold’s Gym is not quite as high quality as the equipment that they have at their gyms, it is affordable and provides a great way for people to work out in the comfort of their own home. One of the most popular machines put out by Gold’s Gym is the 450 Treadmill. Because the 450 Treadmill is an entry-level model, it is best suited for walking or light jogging rather than full-blown running. Its compact size and relatively small 2.5 horsepower motor mean that it can’t withstand constant use from multiple users or high-impact running in the same way that a more powerful machine could. The easy-to-read console clearly displays how far you have run, how many calories you have burned, how long you have been working out and your heart rate during the course of your workout. The machine comes with six built-in programs, or you can allow the treadmill to design a customized program just for your needs by entering your weight, the amount of time you want to workout and the number of calories you want to burn. 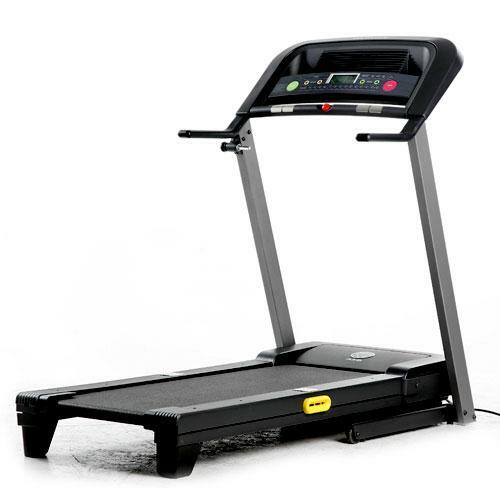 Other features that make this treadmill a pleasure to use include the ability to adjust the incline of the deck, a built-in fan to keep you cool and a pulse monitor that is built right into the grips. This treadmill is a good choice for small spaces since it can be folded up when not in use. It is also easy to move thanks to the wheels that are built into its base. With a surface that measure 50″ long by 18″ wide, the 450 treadmill has an extremely compact size. The shorter length of the treadmill makes it best suited for walking rather than for running. This is particularly true for taller people who have a longer stride length. Another problem with this machine for tall users is that the height of the console and the grips cannot be adjusted. They may be too short to be used comfortably by people who are over a certain height. The best way to know for sure whether this particular treadmill is a good fit for your body is to try one out in person. If you can’t do that, you should at least compare the measurements of the machine with the measurements of your body to try to get a feel for whether or not it would be a good fit. Priced under $400 as of the fall of 2010, this treadmill is a great option for people who have a limited budget with which to purchase equipment for their home gym. Keep in mind, however, that the low price point comes at a cost. Unlike treadmills in the $1,000 and up range, this lower-end treadmill may need to have its parts replaced more often and only comes with a five-year limited warranty on the motor. Interestingly, the other parts on the machine are guaranteed for a mere 90 days. Many users find that to be cause for concern. After all, if the parts were reliable, it seems like the company would have provided a longer guarantee than just a few months. The 450 Treadmill by Gold’s Gym is best suited to users under 275 pounds who plan to do mostly walking or light jogging rather than full-on running. However, if you are on a tight budget and plan to spend most of your time on the treadmill walking, it can be a good choice. Just be sure to try to stand on one in person before buying to make sure it is a good fit for your body. Also, keep in mind that the machine is quite limited in terms of its warranty and guarantees. If you have the money to spend, you may find it beneficial to invest in a slightly higher end machine rather than worrying about having to replace parts within a relatively short time frame.